The first option is a standard photo frame with clips, which doesn’t have a framed edge at all. This consists of only the backing and glass, and uses clamps to hold it all together. You can place your wool painting in this type of frame, but no matter how hard you try to trim off the wool that extends beyond the edges of your picture frame, it will not be possible to remove everything. In most cases, a painting placed in this type of frame does not look very neat and the wool may “leak” out the sides due to static electricity, small breezes, or a curious pet. The most common option is to exhibit your wool artwork under the glass of a standard frame. The best way to decorate a picture made of wool is to use a wooden or plastic picture frame. This type of frame encloses the edges of the wool artwork and the picture looks finished. Frame with mat. Connoisseurs of painting who visit museums often see small works of art exhibited in huge frames – but the open space between the picture and frame is covered with a plain sheet of cardboard. This is called a “mat”. The mat is not used to inflate the size of a small painting. Instead, this special method of décor is designed to protect the picture from external factors. A mat is created using a large piece of cardboard, where a smaller “window” is cut out for displaying the image. The picture itself is then inserted behind the mat. 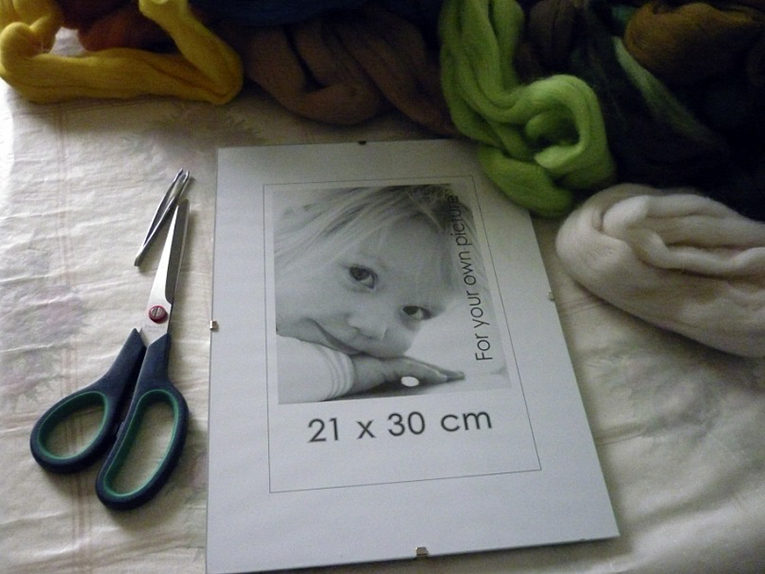 The cardboard for matting the picture can be of different thickness, depending on the type of artwork. For example, with oil paintings artists use the thickest cardboard, so the picture does not come in contact with the glass and cause damage. But for wool paintings, the mat must be made of thin cardboard, or colored decorative paper, since the fibers have to be pressed against the glass. The color of the cardboard mat also has a decorative function and allows the artist to underscore the seriousness of the picture. A dark colored mat visually “pushes” the picture into it, where a lighter color will “push” the artwork upward from the mat. ← Painting with wool – everyone can do it!